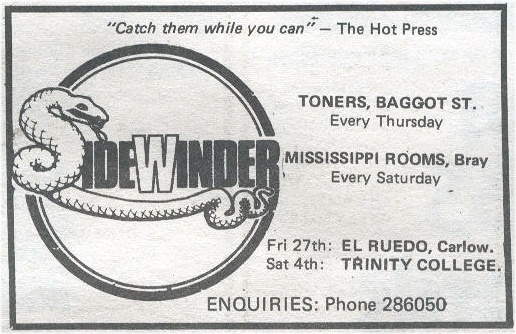 Sidewinder formed in Dublin in December 1977 and were active during 1978-79. Silke, Tracey & McCoy were all ex Zebedee and the Tomato Soup Band. Christy Clarke was ex Van Winkle; Tommy Keyes ex Randolf. They recorded a couple of demo tapes which were well received. 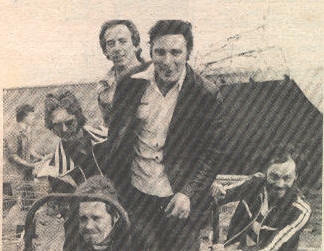 Pay Kenny played their first demo on RTE radio. Their live set was mostly originals plus covers of Graham Parker, Ace and Bob Seger. They played the Dandelion Market on Sunday 24 June 1979 with The Haze. Recorded at Keystone Studios Dublin in 1978, 3 tracks. Recorded at Keystone Studios Dublin in 1979, 3 tracks.